What a treat on Thursday night! It was raining in Vancouver (a rare event, I assure you) and I was invited to attend a lecture about Enrico Fermi….by his granddaughter no less. It ended up that Fermi’s wife, Laura, was what I found more interesting. Like most physicists, I already knew a lot about (Dr. E.) Fermi. I would guess about 80-90 people attended the inaugural meeting of the Society of Italian Researchers & Professionals in Western Canada. Yes, the Canadian-Italians in western Canada want a science café and tonight was the start. Consider this: roughly 4% of Canadians are of Italian descent, the same fraction as Canadians in the LHC experiment ATLAS. Most Canadian-Italians live in Toronto or Montreal and the rest work at TRIUMF(!). Called ARPICO, the new society promises to be a place to meet, discuss, eat, drink, and learn…hard to argue with the premise. 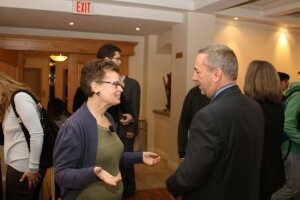 Olivia Fermi was invited as a guest of honour and keynote speaker. She is compiling an interesting history story of her grandparents, two very remarkable people. She talked about stuff we never hear. Enrico would come home covered in graphite from the atomic pile. In those days, there was little sense of the dangers of radioactivity. Enrico died of stomach cancer, perhaps from his overexposure to radiation (although see Argonne’s effort to document how and why the Chicago-Pile 1 Pioneers died). Laura Fermi, Olivia’s grandmother and Enrico’s wife, was to become a successful author and environmental activist—long before too many people cared about the environment, lobbying against the impact of coal and one of the players in the Clean(er) Air Movement in Chicago. She also helped start an anti-gun lobby. How brave was that back then? I have my own arm’s length connection to Fermi. I had briefly worked with Herb Anderson, Fermi’s post-doctoral fellow, when I was a graduate student. I remember he had lost one lung from berylliosis, a disease that comes from breathing beryllium dust, which he acquired from machining beryllium for the pile. When I worked with him, our experiment was using a beryllium target and so I naturally thought he would be unhappy as he walked in the door and I stood there holding it in my hand like a coffee mug. But he wasn’t—only the powder is a problem he told me. *whew* I had escaped admonishment from the senior professor…with luck, I could still graduate! Olivia said Herb’s children were her babysitters. I liked that. make it safe. Her view was that coal is much worse for the environment than nuclear, yet the world has a magnified fear of nuclear power and people should be more rational. She’s following in her grandmother’s shoes on this one! Someone asked if she had tracked down any of the other grandchildren of physicists of that time; the answer was no. Then someone shouted out Facebook.…everyone laughed….the questions were finished. On to the food and wine. Nice evening. Grazie.